Yes, there is. And the last thing you want to do is purchase a used vehicle that is damaged and will cost you hundreds and thousands of dollars in repairs. Do you really need this report? 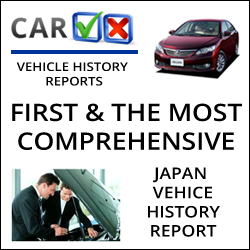 Well statistically, every week thousands of used cars with hidden defects sold across Japan through auction houses, domestic sales and dealer stocks. Majority of them end up in stock of car exporters. There is high probability that defected car maybe sold as decent car to abroad. Therefore if you purchase an expensive car or car for a personal use we advise you to check report on the car before you make a payment. Even once you paid for a car or received it, you may share this report to the claim department in order to ask for compensation or refund. But my manager said that car is in perfect condition and even shared auction sheet to me!? In sales industry, information we receive from sales manager is very important. We understand that they are professionals in their field and can teach us many things. However, you also need to take into account that sales managers are company workers that both paid and incentivized to sell. They are bias to it. So whether to show up true report or not solely their decision. In addition to that, 95% of sales managers perform duties from offices located far away from a place where your purchased or potential car is located. Moreover, we would say that more than half of sales managers never visited car auction houses even once. Basically most of sales managers see the same information on the car that you can see on your screen. Who are majorly mislead on car condition: big exporters or small companies? Both groups may betray ethics. Like the sign says, "if the cash is there, we dont care". For example, here is transformation of damaged car to stock offer by one of the famous exporter "Bexxxxrd". They have access to parts, they sell parts and they have repair garages in every major ports. Other export companies even with well know brands like "SxT JAPAN", "Axxxcom", "Jxmex", "Nixxx" etc., directly or indirectly, intentionally or unintentionally involved in such kind of activity as well. Ok, should I trust than to Auction Sheet information? How much this report costs? This report cost 3500JPY, it is around $30USD, not a high price to be sure on car condition. Actually this price can be easily compensated by the manager through discounts. Majority of sales manager even of low level hold authority on FOB price discount within range of $50 to $100. What CARVX report checks for? Next articleBest Car Cleaning & Restore Products with International Shipment. Car Dealers Choice!